At the same time, people also look for sturdiness of the device, ability to allow them to set the temperature that they want. Currently, there are many soldering stations that come with most of the above features and some even offer few additional features as well such as digital display readout, ESD safety features and so on. In today’s post, we are reviewing one of the hottest selling digital soldering station X-TRONIC – 4040 XTS – 4000 series. We will also conclude if this is the best soldering station out there in the market? Let’s review and decide, how this sleek looking soldering station fares in various departments. This is an advanced soldering station that has literally everything you need for achieving a perfect solder. Comes with 4 air nozzles, 10 assisting soldering tips, 1 additional extra hot air and solder heat elements. 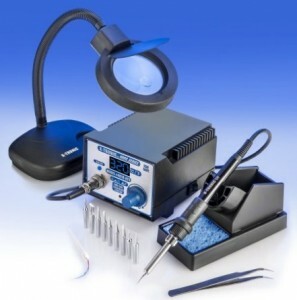 This soldering station comes with a free magnifying lamp with the purchase. So, you need not spend additional money for buying a separate magnifier or helping hands. You can set /view the temperature either in degree Celsius or Fahrenheit. 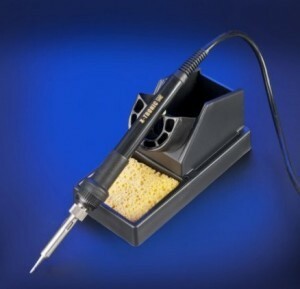 Xtronic -4040 is actually a 2-in-1 soldering station that has an heat air rework gun as well as a soldering iron. It means you get dual benefits. Temperature can be controlled both in air gun and soldering iron. Xtronic 4040-XTS meets one of the most desired aspect of a soldering iron. It heats up rapidly. What Customers Felt About This Soldering Station? This Xtronic station received glowing reviews across the internet. This reveals the trend that, the product scored extremely well in customer satisfaction. A customer shared that the heat air gun which was added as a bonus to the soldering station package, was quite useful in works such as replacing a broken glass of mobile by spending just a few dollars on a repair kit, which otherwise would have cost him at least 10-15 times the money for getting it repaired outside. People are using this soldering station for jobs such as computer repairs, fixing DC Jacks, replacing USB ports, fixing game consoles, fixing guitars, DJ amplifiers and they have reported that the tool works great. One user stated that he was very much satisfied with the digital degree setting so that he was able to use the right solder tips for the optimum temperature for his job. The soldering station is delivered to you with additional iron tips, air nozzles, tweezers and replacement heating elements (for both iron and hot air gun) and not to forget the magnifier lamp which were well appreciated by the buyers. Electro Static Discharge can create a spark when different objects come in contact of each other and the spark can cause damage to the components. However, this soldering station is ESD safe; which means, you need not worry about damaging the delicate components while you are the soldering job. This feature was also liked by many people. Defective bonus addons: While the soldering station scores great marks in various departments, some people have complained that the magnifier lamp included in the purchase had some issues with it. However, the customer service was good and the company responded well to customer queries and even replaced the magnifier lamps in some cases promptly. Relatively new brand: X-tronic is not a super brand like Weller or RadioShack, so it would take them some time to establish that kind of reputation in the market. However, that doesn’t mean that the soldering station we just reviewed is inferior by any means. Is X-tronic , the best soldering station yet? Though priced little higher than Weller WES51 (Read our review) , considering the features X-tronic soldering station comes with, we felt that this is surely one of the best soldering stations that has entered the top league dominated by Wellers and RadioShack.